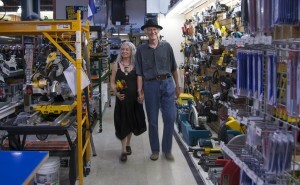 Lovebirds Randy Richmond and Theresa Blanding started feathering their nest in Boulder landmark McGuckin Hardware 12 years ago. The couple spent so much time in the Boulder store, that they joked if they ever married, the nuptials would be cemented in the tools department. 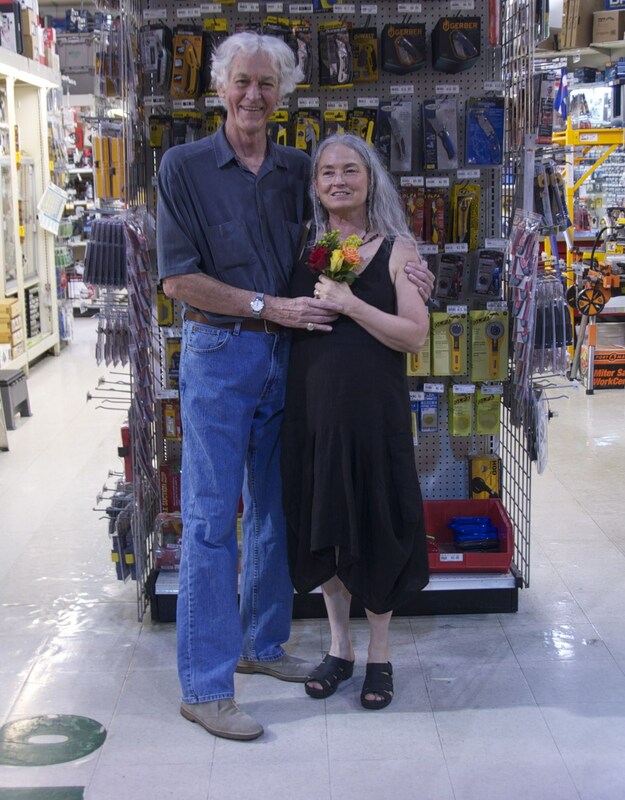 On July 21, accompanied by a small band of well-dressed family members and close friends, Richmond and Blanding walked hand-in-hand down aisle 16 — in the Tools department — to hammer out their future together. The betrothed, being snapped by Blanding’s son, Lucian, strode in sync along the waxed floor lined with circular saws, which should not be misconstrued as a metaphor for their married life. The couple have bought an array of items from the hardware store throughout the years, including Richmond’s favorite pair of overalls. Blanding, a mother of three, is a consultant and award-winning jewelry maker whose work is featured in an Arizona showroom, but her goal is to have a gallery of her own in Boulder. Aaron Tye, a McGuckin automotive employee, made the celebratory announcement over the intercom system. Customers greeted the news with resounding cheers and robust applause from all four corners of the store. Not surprisingly, the couple requested McGuckin gift cards for wedding presents. The couple is planning a honeymoon in Paris. Westword, Denver’s favorite snarky, alternative newspaper, has had a couple of stories recently worthy of repeating. Because I am a Capitol Hill dweller, any new restaurant news grabs my attention. Westword restaurant critic Gretchen Kurtz recently reviewed the tiny restaurant DiFranco’s, a “tiny spot creating big buzz” in the long-suffering Beauvallon building at 955 Lincoln St. That space has represented revolving doors for retailers and restaurants alike ever since it was built. But Kurtz says the little Italian spot that could is well worth a visit. On a recent Tuesday night, the place actually ran out of food, according to Kurtz’s review, even though there was a hungry mob waiting in a long line. Hours are 11 to 8 p.m. Monday through Thursday; 11 a.m. to 9 p.m. Friday and from 9 a.m. to 3 p.m. on Saturday. Phone: 720-253-1244 (just to make sure they haven’t run out of food). Check out Kurtz’s review at www.westword.com/2013-07-25/restaurants/difrancos-restaurant-review/. Host Dave Hill introduces viewers to bands that I have never heard of (but then I’m old). No matter which way you 5280, it’s still good pub for our fair town. Check it out at http://mtvother.com/. Celebrate the grand opening of the Downtown Denver Garden Block during an afternoon event from 4:30 to 6:30 p.m. Aug. 7 featuring live music, giveaways, light snacks and drink specials from restaurants on the block. Come mingle in the lush garden and learn more about the importance of this project and its events planned this year. The Downtown Denver Garden Block is an oasis on the 16th Street Mall bringing a unique environment to the block between Champa and Curtis streets. Installations of various small gardens, representative of those featured at Denver Botanic Gardens, create a pocket park on the 16th Street Mall by giving downtown visitors, residents and workers a beautiful place to meet, linger and enjoy the urban landscape.Sponsored by the Downtown Denver Business Improvement District, in partnership with Denver Botanic Gardens, Bellco Credit Union and the Colorado Garden & Home Show, the Downtown Denver Garden Block will continue to showcase additional features throughout the summer, including more seating, a place to read and play games, weekly lunchtime performances and events, and downtown’s newest Wi-Fi hotspot provided by local internet company www.Forethought.net. Giveaways include two tickets to a Park-to-Table dinner at Skyline Market on Friday, Aug. 9; two tickets to a Denver Botanic Gardens concert and four family-pack tickets to Denver Botanic Gardens. Did you hear that I have a new column, “Mile High Life,” in Colorado Community Media’s 17 weekly newspapers circling Denver? Be sure to like my Facebook page! Also, here’s where you go to get my column emailed to you Mondays, Wednesdays and Fridays. I’m now the social-media liaison for the Mile High Chapter of the Colorado Restaurant Association, so read my latest restaurant news there. My email: penny@blacktie-llc.com.